Big money deals are back in style. 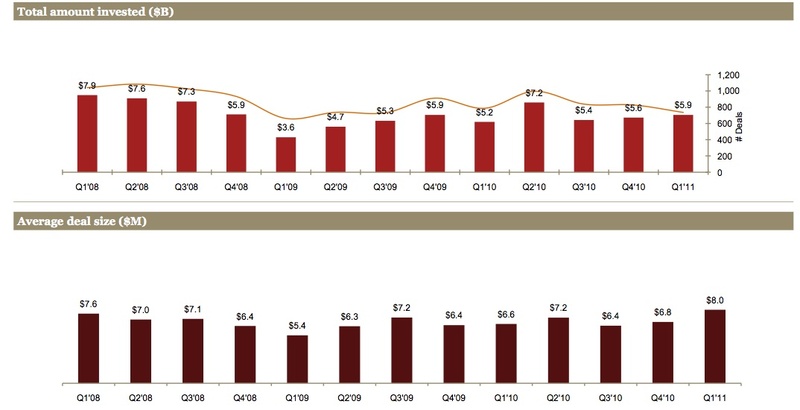 Venture firms dropped nearly $5.9 billion on 736 deals during the first quarter of 2011, a 14 percent increase in dollars over last year but a 6.5 percent drop in deal volume, according to the latest MoneyTree Report by PricewaterhouseCoopers LLP and the National Venture Capital Association (NVCA). While the number of total deals hit its lowest point since the third quarter of 2009, VCs appeared to be falling all over themselves to invest huge chunks of change across the software, biotech/energy and media industries. This quarter, 14 companies secured rounds of at least $50 million, while four drew more than $100 million. The industry hasn’t seen figures like that seen the third quarter of 2001. As expected, the biggest windfalls went to established companies playing the IPO waiting game, as the later-stage investments rose 52 percent from the last quarter alone. Cleantech played a large role in the later-stage surge. The capital-intensive industry had a near-record-setting billion-dollar quarter, grabbing six of the top 10 venture deals. The largest VC deal of the year went to Oakland-based solar-plant builder BrightSource Energy, which brought in $201 million in later-stage financing. Plastic Logic, a Mountain View-based e-reader technology firm was a close second with $200 million. Meanwhile, New York-based software firm Appsense received $70 million in later-stage funding. Digital music startup Beyond Oblivion, also headquartered in the New York, received $77 million in early-stage funds. Overall, VCs spent an average of $8 million per deal this quarter, up from $6.6 million this time last year and $6.8 million last quarter. The largest chunk went to the software industry, which received $1.1 billion, up from $809 million last year. A fifth of those funds went to multimedia, cloud computing, mobile apps and mobile devices. The biggest dip in deal volume and funding came at the seed level. Seed investment shrunk down to $121 million from $423 million last year. And only 56 seeds were funded, down 36 percent from last year. The decline in seed deals can perhaps be attributed to the rise of super angels, who are increasingly stepping up to fund fledgling startups, especially in the consumer Internet, mobile and digital media sectors that don’t require huge amounts of capital to get started. At least for now, the VCs appear more interested in fertilizing select early to later-stage companies with big bucks than watering a whole bunch of seedlings. But when green starts to peek through the ground, VCs will likely appear, offering some green of their own. Photo courtesy of (CC BY-SA 2.0) Flickr user Tracy O.
late stage financing shd not be classified as VC any more, there is no venture in it at that point.